Winter is the season which does not go along well with your hair. Split ends, dry frizz, static electricity are some of the main problems your hair face in the winter season. Split ends need a check during the winters so make sure you chop them off... that's first step towards a happy hair season! Most of the beautiful ladies prefer short hair during winters, being a long hair lover I would never advise you to do that but can't agree more that it really helps if you are a working woman! The above hairstyle are best for a working day. That bun is not OTT yet pretty luscious at the same time! When your wearing you winter beanies then letting your hair down looks very pretty. The third hairstyle is pretty too. Short hair with hints of color are totally IN! Be it summer or winter or for that matter any season, braids be the best! Nothing can beat the comfort level of braids. The above braids give you a gorgeous and funky look. Flowers simply add to the beauty of hair! If you have curly hair, it's time to experiment and try crazy hairstyles! The messy curly mushroom look is totally hot. The porcupine hairstyle never gets old! The above one has defined pokes which makes it even more appealing. If you have extra silky hair I think you should go for the third cute boy look! Comfort friendly men, the sleek hairstyle id for you. It's our hottie Leonardo De Caprio's favourite too! Tip: Do not expose your hair to harsh chemical products especially during the winters. Mix a little gelatin in equal amount of water and use it as a hair gel instead! P.S: There's an amazing giveaway going on on my first blog. Don't miss it friends!! Availability: Available in all their clinics. Check out this page for more. I don't use makeup removers much. It is always baby oil or baby wipes for me. But lately my eyes skin has become extra sensitive and I can't rub my eyes with oil, it has become painful and not satisfactory! This cleansing milk by Dr Batras is my first makeup remover and a favorite at that! The best thing about this cleansing milk is that it does not give you the feel that you are using chemicals but instead it gives you the feel of using a natural product... a thicker version of milk I would say! It does its job nicely, removing all the dirt from my skin without hurting it or letting it loose it's moisture. I use it whenever I am back from an outing too...Bangalore pollution you know! It has never given me skin irritation or any other negative sign, its all smooth and butter-like to my skin. As mentioned above, this wonderful cleansing milk contains Echniacea, known for its antiseptic properties. It also contains chamomile. So it's super hydrating and effective at the same time! I haven't given a swatch here coz it's perfectly like milk...A thicker version of it!! *Waterproof makeup doesn't budge unless you use it 2-3 times! All in all it's a wonderful cleanser which acts effectively without upsetting your skin. You really need to give it a try! Shopping experience at Amazon.in : Laser printer ! A month back my ink jet printer crashed and when we took it to the repair guys they said they would charge about 3k for the printer . And we were left open mouthed, because hey you could get a new ink jet printed in 3k. So what if our printer was a HP printer acquitted with fax, scan and printing. It was over. that is when the search for a new printer began. And we wouldn't settle till we got the best one! And then Amazon happened ! After a lot of comparison of prices we found that no other site could beat Amazon when it came to printers and prices ! So within the next few days we zeroed upon a laser printer that had the feature of photo copying ! yayy! Just that it did not have fax but it was a godammn Samsung Multipurpose laser printer ! To seal the deal was the GOSF sale and the discount on the Laser printer we ordered just doubled ! Tralala ! Wasting no more time we ordered the printer immediately! 2. We get regular updates on our order through mails and SMS! 3. Absolutely loved the packaging! 4. It was bubble wrapped and came with some more extra protection ! 5. The product was in perfect condition! And the installation was easy peasy , thanks to theinstruction guide! 6. The Amazon product page has helpful reviews from past buyers which helped us choose a good printer! 7. The overall packaging even after we opened package was awesome ! You can see it clearly in the pictures ! Although the only thing that we disliked was the plug in of the Samsung which required a Max size plug point . But that’s just a minor gripe. I would recommend this printer to each and everyone looking to buy a affordable multipurpose laser printer ! Its very good ! Just make sure you have enough space, it’s a tad bit huge than we expected it to be! Functions: Photocopying, scanning and printing. Prints both color and black ink pages. Price: Priced at INR 12,999. We got it at a discounted price of INR 6,888 from Amazon.in ! Now selling at even less for INR 6590 ! Brand: There’s no need to go gaga over the famous and loved brand Samsung ! Plus Samsung has given the product a warranty of about two years ! We are just happy people haha! Loved the overall experience of shopping at Amazon and guess what I already placed my second order (Ear cuffs ) *Jump of joy* on Amazon ! Can’t wait for it to get delivered Will be up shortly on the blog! Truth has its own aura and essence. No matter how believable and comforting a lie might be, it always fails to truth in the end! One such incident happened with me in my life. It not only taught me how truth was the ultimate answer for every situation but also made feel the beauty and comfort offered by honesty. When I was in my high school, our school had kept a send off for the tenth standard students in our school. We being a part of the high school were a part of the farewell party. Farewells meant fun and a lot of rule breaking. My parents had taught me to always let them know about my whereabouts and my plans for the day if any. One day before our farewell, my friends gathered for a meeting and decided to hangout after the farewell and the place they had decided was a mall very far away from school and a place I had never been to. I knew I had to take my parent's permission and go only with their consent but a devilish voice in my head said me that my parents would decline the idea and not let me go. Whatever the reason, I decided to keep the truth out and instead of telling my parents that the farewell would end by 1:00 I lied to them that it would end and 5:00 saying it was a very long function. So at 1:00 when the whole farewell party had come to an end, I tagged along with my friends to that mall hoping to have the time of my life. But what happened was exactly the opposite! The whole way to that mall, I was overcome with a strange splurge of guilt. While all my friends chatted and had fun, the only thing which kept tugging on me was the fact that my parents were not aware about this and I had lied to them. The mall was beautiful but not alluring to my eyes and I was just too overcome with guilt to enjoy the moment. All my friends had asked permission while I had lied to my parents. We dined at a beautiful hotel inside the mall but I didn't order anything inspite of my friends even willing to give me a treat. My bestie noticed that I was not happy and confronted me about it while sitting on a table. I told her what was killing me and how I wanted to call up my parents and tell them the truth right now. My wonderful friend mirrored my feeling and said that I better make it fast as there was a movie planned next and I would never enjoy it if I didn't get rid of the guilt. So, I borrowed one of my classmate's phones and called up mom. She was angry with me and asked my why I was calling her and telling now. I told her that I was sorry and I was calling because the guilt was eating me up. I could sense my mom smiling. At last she told me that it was okay and that I should never repeat this behaviour again and asked me to enjoy the evening and also told me that she wouldn't mind if I was a bit more late. My happiness knew no bounds. The truth had comforted me and I felt like I just won a battle... an inner one! The above TVC so beautifully describes the same thing!! It has been a while since a friday five was featured in here but here I am bringing you a beauty and skin care edition of fab fives. All of us pamper our skin with luxurious skin care products to keep our skin glowing, nourished and beautiful . But these products have an overload of chemicals which is best avoided. Including some inexpensive home made DIY beauty remedies in your beauty regime is always a good idea. I mix the three in a spoon and scrub, wash, exfoliating done. Try this once a week and you will never have to buy any lip scrub ever. But make sure almond oil you use is 100% organic. you can even replace almond oil with jojoba oil. Mash up a banana and mix with one tablespoon of almond oil. Massage this mixture into hair , especially the ends and leave for 30 minutes. Was for smooth soft hair. This mask helps protect natural elasticity of hair and locks in the moisture. I do this in winter. This isnt really a DIY as such but I use virgin coconut oil religiously to tame my dry hair. Coconut oil deep conditions and moisturizes hair like no other serum can. I oil my hair with warm coconut oil and leave it overnight for best results. Apart from adding shine and stength to my hair coconut oil also acts like a soothing balm for me relieving stress. These are real simple DIY remedies I recommend to all. Do try incorporating these in your beauty regime and cut down on pimples. This post is coming a bit late and no my laziness isnt to blame here. I actually dint want to cover this wedding because Riddhi Malhotra isnt a celebrity. But being Manish Malhotras Niece and sister of director Punit Malhotra many B town celebs were in attendance wearing looking their shiny best and I couldn’t resist not posting this. Most celebs opted for creation of Manish Malhotra lehengas but there were some who showed up in other designs too. Lets get to seeing who wore what. As always we start with the bride . Riddhi Malhotra chose royal blue as her reception colour. she wore an elegant royal blue Manish Malhotra (who else?) lehenga with gold embroidery. Jewelery in same colours, a hair updo with gajra finished her look. I like Riddhis choice of colour for reception. The jewellery , the hair do and make up all worked for her. If I had to change something it would be those bangles. The groom looked dashing in his white sherwani and I loved this subtle colour co-ordination. 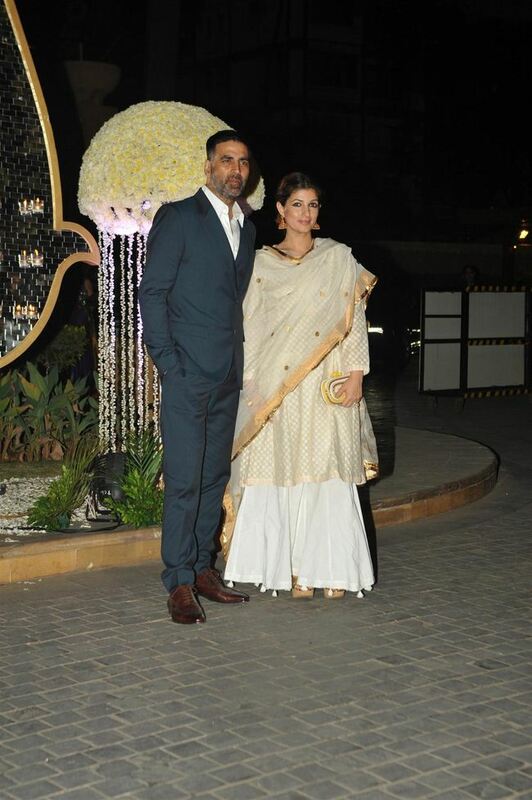 Twinkle khanna was dressed in white and gold long kurta paired with sharara pants. A white and gold clutch , jhumkas and gold wedges finished her look. This is a refreshing change from the anarkalis and lehengas everyone wears . Wish the sharara was co ordinated better and dint have those latkan kind of things though. 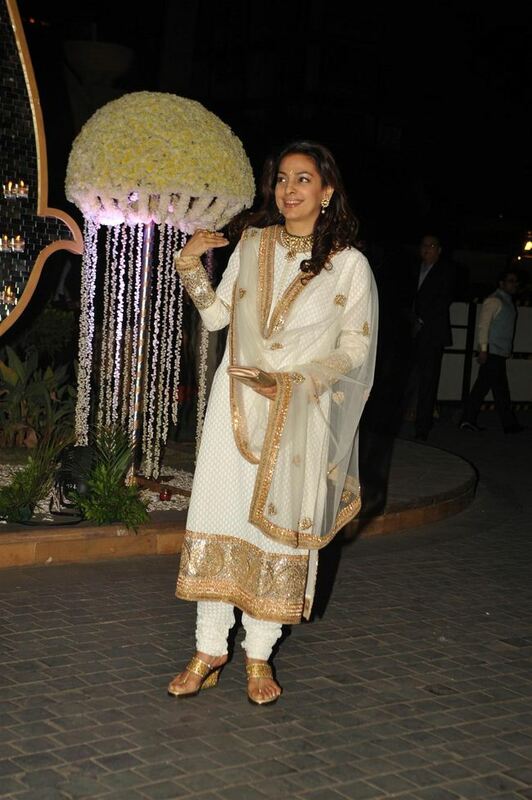 Juhi Chawla again picked white and gold sabyasachi suit. To complete the look juhi added jewellery, wedges and clutch all in gold. The wedges don’t belong to this look, and the necklace should have been skipped. That said Juhi did look good. More white in this reception. Karishma wore a white net Manish malhotra sari paired with white clutch and diamond earrings. She looked great . Urmila also wore a white and red saree by manish malhotra. a choker, gajra in hair , bangles , red lips and potli finished out her look. A bit over the top but it is an indian wedding, so no complaints. She looked great. 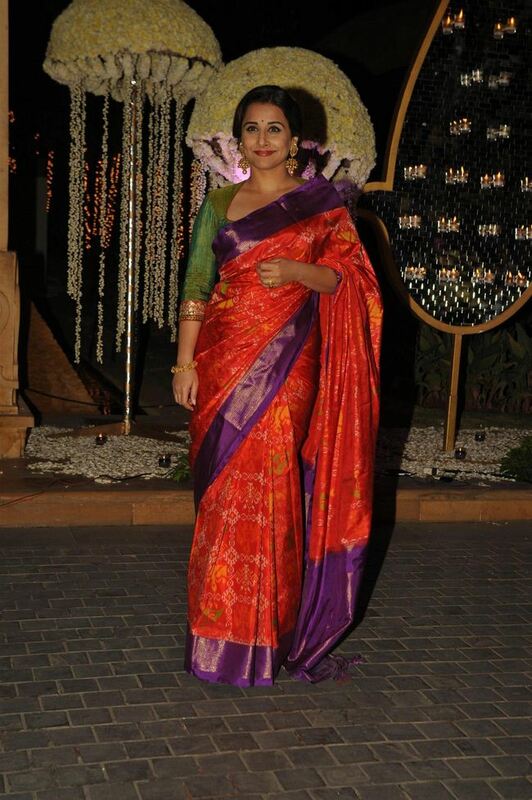 Vidya Balan was dressed in a traditional silk saree paired with a green blouse ( predictable much?). Gold jhumkas finished out her look . . She looked great but I do wish she experimented a bit . Oh and those jhumkas … Iam in drool land! 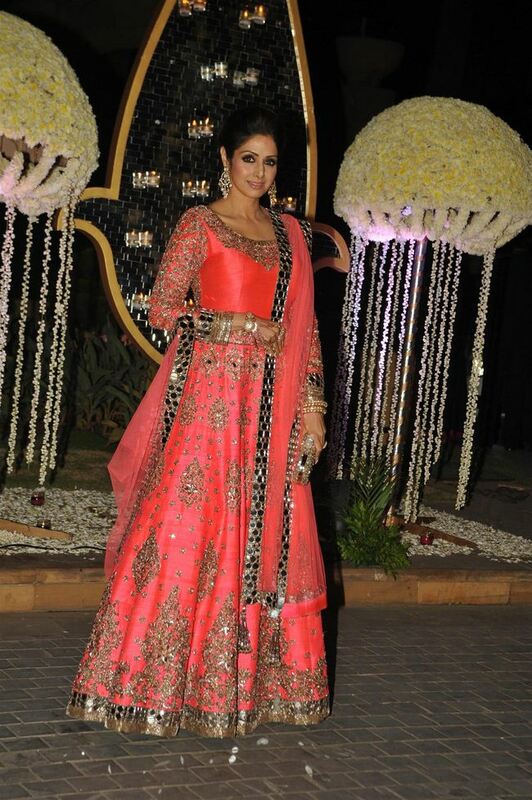 Sridevi wore a pretty pink embellish manish malhotra floor length anarkali. A blingy gold clutch and diamond earrings finished out her look. I love this outfit and would easily wear it on my wedding reception. If I dint know better I would think it was Sridevis wedding . Overdressed for a guest but she looked good . Priyanaka choapra was seen in a pink manish malhotra saree which she paired with gold glittery strappy blouse. She looked good. 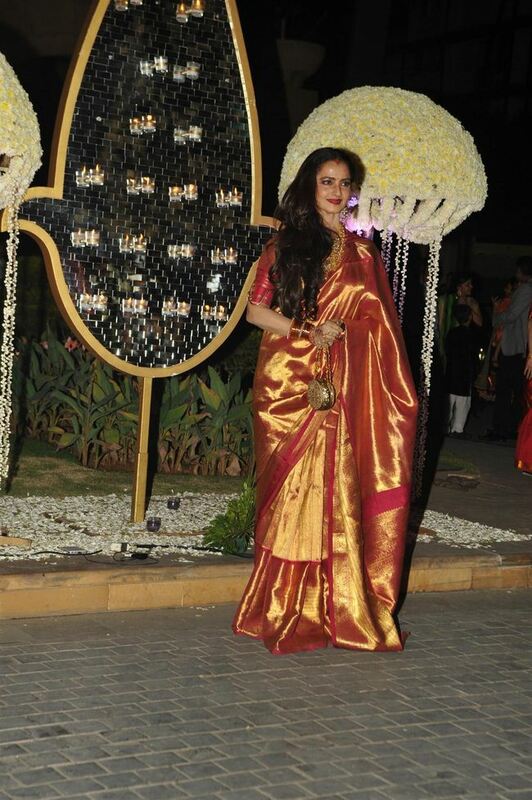 Rekha well stuck to her some old style. No comments! Wearing a lehenga from manish malhotras mijwan collection was Kirti sanon. I love the colours in this look. Fresh and young. A win. Looks like most of the celebs were dressed to out do the bride. This is the Not way to dress to a wedding. I pity the bride. how do you think her photo album will look. ? So instead of asking who was dressed the best at this reception id like to ask you who all do you think were dressed almost like a bride? The Beauty Hotlist: Top 5 best budget blushes ! A little blush on cheeks can make a big difference! Blushes have always been looked up as to bring a more youthful appearance, and to emphasize the cheekbones !I think there's something quite charming and attractive about a beautifully applied blush that can't be replaced by anything else in a makeup routine. Also I have a childhood confession to make, and don’ you dare judge I was just a child! Well when we were kids we ofcourse had zilch knowledge about makeup but we often saw are teachers and dance teacher use blusher and we would wait for the makeup thing during the school day dance thing , no really you have no idea how it feels to finally wear makeup that looks so much similar to a bollywood celeb we adored !And guess what we ( By we I mean not just me but other girls in my class, it was a norm then) would steal are mommies or aunties red or pink lipsticks and actually smudge it directly with the tip of the lipstick to our cheeks and ended up looking like we just stuck a red circle on our cheeks. Haha. But looking ugly didn't seem problem then , we were always ready to give it a try ! Blush makeup is used to simulate a natural glow and must look subtle. Not whiny and attention seeking ! However, there are many ways to apply blush so that you not only add vivacity to your complexion, but also highlight the correct part of your face. All of these cost below INR 500 ! Yes ! And they beat brands with pricing more than a thousand bucks ! But do check if the shade suits you , even though these blushes are available in many shades! I have dry skin and as if that was not enough I have very dry split end prone hair and to add to the problem list winter has arrived. The Schwarzkopf Professional range lands up at a right time on my door step promising me to rescue and repair my dry damaged hair. I have been using the Shampoo and conditioner and the mask (which will be reviewed separately) duo from Schwarzkopf Bonacure Professional range fo about 2 months now and this I feel has been tested enough to bring you a detailed review. Packaging: Both the Shampoo and conditioner come in a white slender can with a red cap. I love this classy red-white packaging , it gives a very elegant feel especially because I haven't used shampoos packaged in a can before. The packaging is easy to use but not too travel friendly simply because it is big in size. The shampoo is white in colour and has a pretty runny consistency . It foams well so a little bit is enough to clean dirt but if hair is oily two washes maybe necessary. In fact I have been using the same bottle for 2 months and there is atleast half of it still remaining .The best part about this shampoo is the smell which acts like therapy giving a feeling of being in a luxurious salon or spa. The after effects are amazing as my hair feels silky soft , smooth and manageable. My hair fall problems also seem to have gone with the wind after I started using this . This shampoo has also added much need shine to my dull hair. Iam totally loving this shampoo. The conditioner which is also white is thicker in consistency and has the same fresh salon like scent. The shampoo as I said earlier does great job of adding shine and making my hair manageable so as such I don’t need a conditioner. But using this adds moisture to my hair and makes them shiny. I have used the shampoo alone and I feel if you are using this shampoo you don’t need extra chemicals . This conditioner was needed when I started this range and my hair needed a lot of repair rescue but after a month I have stopped using the conditioner and have reserved it for occasional use when iam having real bad hair day and my hair needs deep conditioning. Easily Available at salons and online. Verdict: Overall I loved this range and it has worked wonders for me. If you have damaged hair issues then I totally recommend this range to you. You should at least try the shampoo if not the conditioner and see the amazing results. The new style staple: Kaftans . 7 Ways to wear a Kaftan. n designers started bringing Kaftan styled kurtas and dresses on the runway! So lets begin with the history of Kaftans or (Caftans)..
What is a Kaftan? A Kaftan is an ankle-length or a mid length dress front-buttoned cloak or overdress first worn by the Persians in the 600 B.C’s and is usually made of light fabric such as cotton, silk or cashmere. The Kaftan trend have re-emerged throughout the fashion history again and again. It might just sink in and disappear for a while but when its back it just gets better! Ethnic edge to the Kaftans: It can also be worn as a Churidaar Kameez top . YES ! :D But just make the hemline reaches below the knees or till it touches your ankles. That’s it! Team it up with a pair of comfy chudi pants. And without much effort the spotlight turns on you. There’s no doubt that kaftans give the wearer both a sensual and elegant appeal. 1. Beach wear : Kaftans are a perfect way to cover up after a swim at a beach ! 2. Palazzo Pants : Style an elegant Kaftan with a pair of Palazzo pants and in a jiffy you are ready to rock the world. Wear it to a tea party, social event, or even hell shopping ! Monochrome trend: A white chic kaftan over striped pants, you’ll end up looking like a diva! 4. Maxi length : Comfortable and stylish maxis are replacing boring figure hugging maxis ! Way to go ! 5. Sophisticated gown dress - (One shouldered) : This ones our favorite! A gown and a dress that too a kaftan? Wow and how! Simply stunning. One can wear them and feel comfortable and look fashionably forward at the same time! 6. Dhoti Pants: The dhoti pants are never out of fashion , so why not pair it with a kaftan top and dazzle the world? 7. Skirty edge: Pair a Kaftan with a set of hot pencil skirt , and nothing ever could go wrong? Agree? Which one of the style's have you already worn? And which among these are your favorites? Every year Pantone the colour company releases their “Color of the Year,” after studying and analyzing trends online and offline. This year pantone has selected ‘marsala’ as the color of the year. Pantone describes this colour as an “earthy wine red” . Now if you are wondering if Marsala is even a name of a colour? Well actually no, Pantone has actually named this deep Earthy red colour as marsala after fortified wine.Pantone Feels Marsala is a natural fit for the kitchen and dining room – making it ideal for tabletop, small appliances and linens throughout the home. They also say that this stylish tone is universally appealing and translates easily to fashion, beauty, industrial design, home furnishings and interiors. I have been following the Pantone colour of the year trends for past two years. In 2013 it was Emerald and in 2014 it was Radiant Orchid. I loved both these colours but this years colour is so not my Thing. I like it all girly and fun and marsala is too dark for my liking. Marsala in beauty as a lipstick or shadow is definitely out of question for me . But talk fashion , accessories and clothing , well for that iam set to rock the earthy red. Marsala is esecially a great warm colour for the winters. But bollywood is loving this earthy red for a lip colour. I have spotted Deepika Padukone , sonam and even Jacqueline do the bold lip more than once off late. Celebs have also been seen in Marsala outfits and this sure is the colour to rock this year. Rise Above your fears ~ Sunday Inspirations! TrendyBee.in ~ A jewelry heaven!